"You glance at an e-mail. You give more attention to a real letter or note." 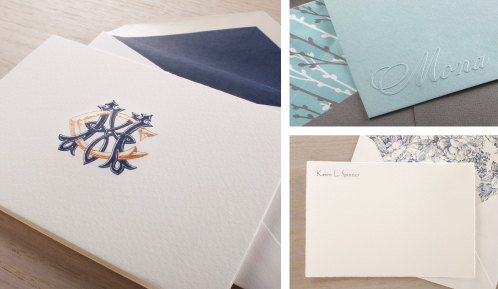 Above, left: An Indigo and Copper engraved monogram personalizes the White Notes of Production Designer Carol Mancini, on rich, textured paper. Top right: Online Support Specialist Mona Coffin's embossed Robin's Egg Blue Correspondence Cards. Bottom right: The elegant Arturo correspondence cards of Karen Spinner, Director of Production Services. 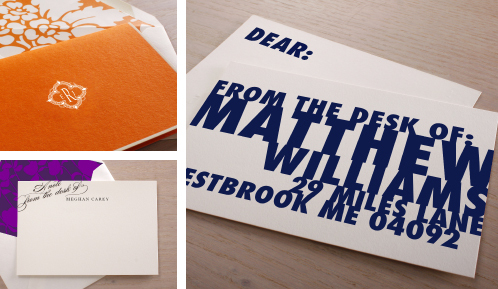 Top: Media Content Editor Melissa Pritchard loves her heavy weight Letterpressed Cards with hand-painted edges. Bottom left: A tasteful two-color engraved monogram adorns the correspondence cards of Lisa Blinn, Vice President of Design and Marketing. 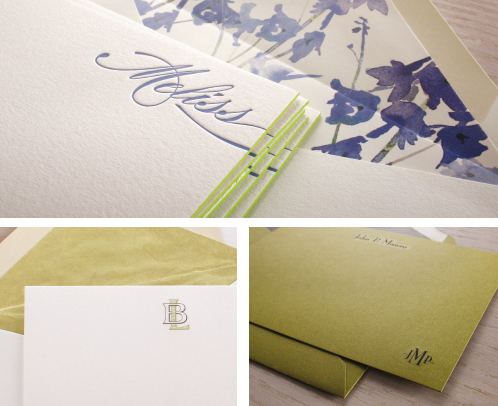 Bottom right: Black engraving on Moss Green correspondence cards for Dealer Sales Consultant John Manzo. Top left: Marketing Designer Emily Regis just ordered these Mandarin orange Vera Wang Bordered Notes with engraved monogram. Bottom left: Vera Wang Art Director Meghan Carey dashes off notes on these From the Desk of Correspondence Cards. Right: The bold, two-sided Digital Cards of Digital Artist Matt Williams.